character's 1895 debut. 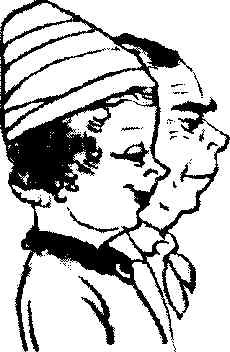 One of them was James Guilford ("Jimmy") Swinnerton, whose cartoons in The San Francisco Examiner, which began appearing in 1892 (when William Randolph Hearst, who was to loom large in comics history, had owned the paper for five years), very quickly came to resemble what we now call a comic strip. Swinnerton was born on November 13, 1875, in Eureka, CA; thus, was a mere teen when he went to work at The Examiner. His main job, back in that pre-photoengraving era, was to illustrate the news. But he also regularly drew editorial cartoons, sports cartoons, and a cute little bear cub to accompany the daily weather report, which would respond amusingly to predicted conditions. Before long, his bear cartoons had branched out, and were appearing all over the paper. More bears were added to the cast, and the feature was called, predictably enough, The Little Bears. It is generally believed to be the first series of American newspaper cartoons to feature ongoing characters. During that period, Swinnerton also drew cartoons about very small children. Sometimes, the two sets of cartoons would be placed together, in banners spanning the newspaper page, in a feature called Little Bears & Tykes. The first such banner appeared June 1, 1892. Was this an early comic strip? Characters sometimes used word balloons, but as The Little King, Ferd'nand and Prince Valiant show, balloons don't necessarily accompany comics. The individual panels weren't arranged sequentially to tell straightforward stories, but they did sometimes show the characters responding in different humorous ways to the same basic situation — is that enough narrative cohesion to qualify as comics? Swinnerton's art continued to evolve in a generally comics-like direction, and within a few years, there's no doubt comics was what he was doing. He missed out on being regarded as the father of American comics, but whether he actually is or not may depend on exactly where you draw the line. In any case, he was behind some very early comics. In 1896 he transfered to Hearst's New York Journal, where he promptly switched from bears to tigers — that species being chosen because cartoonist Thomas Nast had used "Tammany Tigers" to characterize the local Democratic party. (It was also Nast whose donkey cartoons characterized Democrats in general.) Later, The Little Tigers coalesced into one main tiger, Mr. Jack, who talked, wore clothing, walked on his hind legs and had hands on his front ones — possibly comics' first fully-realized anthropomorphic funny animal. In 1904, Swinnerton created his most famous feature, Little Jimmy — another of his "tykes", a very young and very cute little boy. Jimmy (the character) had an amazing ability to become distracted from the simplest tasks, and to emerge unscathed from the often convoluted brouhahas he'd innocently caused. In this King Features strip, Jimmy (the cartoonist) again showed himself an innovator. While still clearly influenced by the Victorians who had gone before him, Swinnerton was moving rapidly toward the clean, open style, with bold, clear lines, that would become popular in the new century. Shortly after Little Jimmy started, Swinnerton contracted tuberculosis, and his doctor gave him no more than two weeks to live. He responded by moving to dry, smog-free Arizona, where he fell so in love with the scenery and the sunsets that, as he later told comics historian Martin Sheridan, "I forgot to die." In fact, he outlived that doctor by more than 30 years. It was he who introduced his friend, George Herriman, to the Arizona desert, a somewhat surreal version of which later became the setting for Herriman's Krazy Kat. Before long, Arizona motifs began appearing in his work — not just his cartooning but also in the painting that formed an increasing part of his output. He created a series called Canyon Kiddies, about small Native American children living in remote Arizona canyons, which Good Housekeeping magazine (another Hearst publication) ran in color from 1922-41. Canyon Kiddies was one of only two outside properties licensed for animated cartoons by Warner Bros. Swinnerton himself made no less than 50 background paintings for Warner, producing a stunning job, unlike anything else in animation. Unfortunately, they made only one Canyon Kiddies cartoon, Mighty Hunters, directed by Chuck Jones, which came out in 1940. The West was also the setting for his only non-humorous comic strip, Rocky Mason, Government Marshal. Swinnerton injured his hand in 1958. He was thereafter unable to meet the demands of cartooning on a regular basis, and folded Little Jimmy. Despite the fact that he was already 82 years old, he lived to enjoy a long retirement. The man who'd almost been pronounced dead around age 30 finally died on Sept. 8, 1974 — 98 years of age. Text ©2001-10 Donald D. Markstein. Art is in the public domain. This image has been modified. Modified version © Donald D. Markstein.